SHANGHAI, April 5, 2019 /PRNewswire/ -- Themed around "LNG for a Sustainable Energy Future", the 19th International Conference & Exhibition on Liquefied Natural Gas (LNG2019) had its grand opening at Shanghai World Expo Exhibition & Convention Center on April 2nd, 2019. ENN, a leading clean energy provider in China, presented a panorama of its full clean energy value chain at the event. 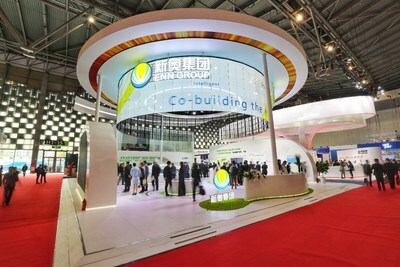 Using a minimalist and translucent booth design at the exhibition, ENN depicts the future of clean energy development and the vision of leveraging global partnership to drive industry innovation and upgrade. Backed by the world's fastest growing LNG market, the Zhoushan LNG receiving terminal and a strong non-pipeline LNG storage and distribution network, ENN has been able to empower LNG suppliers at home and abroad to seamless connected to clients, and offers economical, clean, efficient, safe and reliable energy services with its advantages in resources, technologies, logistics and digitalization. During the exhibition, Zhang Yesheng, CEO of ENN Group visited the booths of ENN's partners such as Chevron, Santos, CNOOC, Shenergy Group and had an in-depth exchange with their management teams. Kevin Gallagher, the CEO of Santos visited ENN's booth. Santos is an independent supplier of oil and gas to Asia Pacific and Australia. ENN has become the biggest shareholder of Santos through its strategic investment via ENN Ecological Holdings. 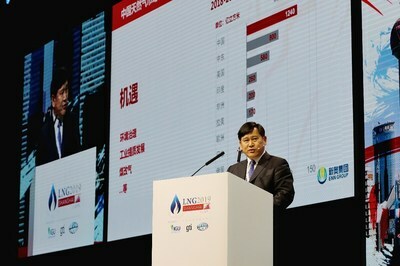 On April 4th, ENN CEO Zhang Yesheng delivered a keynote speech at LNG2019 forum. "The fast growing LNG demand in China is consistently driven by the 'coal to gas' policy, the requirement for quality industrial development and the call for actions to protect blue sky, clear water and clean soil," he said. "For a long period of time in the future, China will be the market with the highest LNG growth in the world." Regarding the increasing reliance of China on LNG imports, Zhang Yesheng responded that the Zhoushan LNG receiving terminal would continually build up its capability of LNG receiving, storage, diversion and LNG bunkering, and align with LNG receiving terminals in Ningbo, Yangshan, Wenzhou and Rudong to form a LNG marine transport network serving the Yangtze River Delta and even the entire east China region. "China is at the center of global LNG development, and Zhoushan LNG receiving terminal will play an important role to link up the global resources with the Chinese market". In October 2018, the Phase I project of ENN Zhoushan LNG Receiving Terminal, also the first large-scale LNG receiving terminal invested and operated by a private corporation in China, was completed and put into operation, with annual LNG throughput up to three million tonnes. The Phase II project has commenced and is expected to deliver annual LNG throughput of five million tonnes in the short-term and ten million tonnes in the future. "We will gradually develop the Zhoushan Index, an LNG price index that can reflect the entire northeast Asia market. This will be made possible by our LNG marine transport network and the existing Zhoushan LNG trading market, Shanghai and Chongqing LNG trading centers, and by giving full play to our advantages in policies, geographical location, resources and industry chain", Zhang Yesheng noted. The International Conference & Exhibition on Liquefied Natural Gas, presented by the International Gas Union (IGU), Gas Technology Institute (GTI) and the International Institute of Refrigeration (IIR), is the only LNG event conducted by the industry for the industry. With themes covering the entire value chain, it is called "The Olympics of the LNG industry". The LNG series of events started in 1968 and have been hosted by LNG importer and exporter countries in turn for every three years. It is the first time for this event to be hosted by China, and the 2019 LNG is the biggest LNG event ever held in China. ENN takes LNG2019 as an opportunity to showcase its strategic layout and strengths in clean energy value chain and to seek recognition widely among its partners at home and abroad. Aiming at building a modern energy system, ENN will cooperate with all partners globally to achieve win-win results.